CHICAGO – January 26, 2009 – Midway Games Inc. (NYSE: MWY), a leading interactive entertainment publisher and developer, today announced that the company has shipped approximately 1.8 million units of Mortal Kombat® vs. DC Universe worldwide for the Xbox®360 video game and entertainment system from Microsoft, and the PLAYSTATION®3 computer entertainment system. "Mortal Kombat vs. DC Universe was the result of countless hours of hard work by many people, and seeing the game surpass the million-seller plateau makes it worth all the effort," said Ed Boon, Mortal Kombat co-founder and creative director, Midway. "We're already hard at work on our next version of Mortal Kombat, and look forward to being able to reveal more details in the future." Mortal Kombat vs. DC Universe also continues to set a number of internal Midway records. The game was the most pre-ordered MK title in company history, and more than 3.6 million Mortal Kombat vs. DC Universe matches have been played online worldwide for the PS3, according to numbers from GameSpy Technology,* which provides connected gaming, multiplayer and statistics gathering services to the title. The standard edition of Mortal Kombat vs. DC Universe is available for a U.S. suggested retail price of $59.95, and a limited number of copies of the Kollector's Edition are still available for a U.S. suggested retail price of $69.95. This Friday (Jan 23) several members of the MK development team will be online playing Mortal Kombat vs DC Universe on Xbox Live and the Playstation Network. 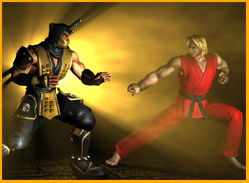 Now is your chance to see how your MK skills stack up against the people who made the game! Friday, Jan. 23rd - 10PM (ET) - Midnight (ET). This is indeed a unique chance, so go and put your skills to a test. Wired.Com has published their list of the top 10 Games of December 2008. Guess what? Mortal Kombat VS. DC Universe made it to both, the PlayStation 3 and the XBox 360 list. Our congratulations to the development team. It has definitely been a while since our last update. Let just say, that we all deserved a nice short break after the tons of news and updates that were made around the release of Mortal Kombat VS. DC Universe. After a short period of silence, the Mortal Kombat development team finally started to show some presence again. In a recent interview, Mortal Kombat co-creator Ed Boon confirmed that there are still plans to get Downloadable Content to the gamers. However things aren't that far yet, but Ed Boon expects at least one character from both sides (Mortal Kombat and DC) in one downloadable packet. Click here if you want to listen to the entire interview.